Now that school is in full-swing, so is the homework. I’ve heard people say that junior year of high school is the most difficult and it’s so true. Munchkin has hours upon hours of reading, worksheets, projects, and other paperwork every single day. Though she gets home in the early afternoon, she’s often working on her assignments past midnight. Obviously, that limits the amount of free time she has. And, when it comes to watching tv series or movies, that ends up limiting what I watch as well. I already told you about how she comes running to my side every time she hears anything remotely close to a video playing on my computer. She’s determined to never let me watch alone…. With that in mind, we have to be very selective in which series we watch. With the new fall season of television shows airing, there are a few we are looking forward to seeing each week. The Flash (see seasons 1-3) starts tonight and, lately, we’ve been enjoying The Gifted. As a HUGE X-Men fan from my younger years, this is a decent series and I so far I really like it! Agents of SHIELD (seasons 1-4) is coming but, with the weird Darkhold storyline and the team now in space, I’m not sure if we’ll keep tuning in. In addition to that, there are only a few extra slots we can fit into our weekly television-watching menu. Fortunately, we already have a couple titles at the top of our list. First up on my list of “to watch” series is Voltron: Legendary Defender. Voltron: Legendary Defender Season 4 will be out on October 13, 2017. Similar to the mini-season released in August, season four will only consist of six episodes. The idea of smaller chunks being released more often is part of the studio’s efforts to lessen wait times between seasons. I’m kind of on the fence about this. I’m pretty impatient but I’d rather wait longer for a nice, developed story than bits and pieces that I’ll forget about before the next release. Oh, well. I really can’t complain. I’m just happy to get as much Voltron Legendary Defender as I can. As I was browsing new shows recently added, I stumbled upon Barbie Spy Squad. 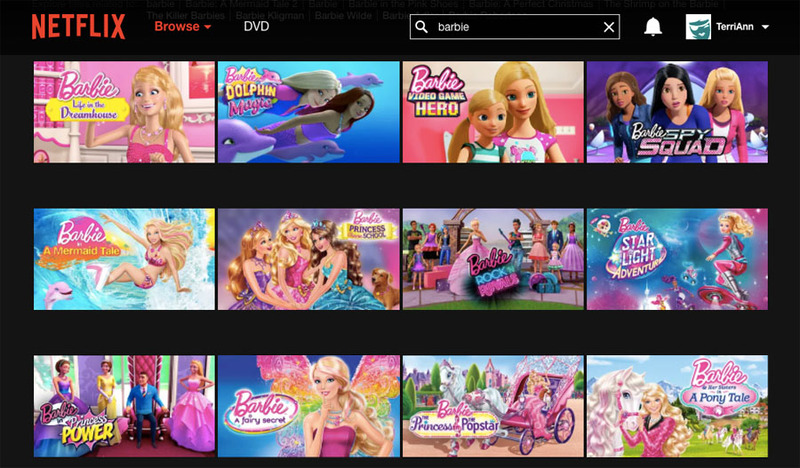 Apparently, this is one of several Barbie movies now on Netflix. Though Munchkin ever liked playing with dolls, she always enjoyed the cheesy Barbie movies. Fast forward to her teen years and she still likes them. As I previewed some of Barbie Spy Squad, Munchkin immediately ran to my side and started watching it. At one point, she even begged me to stop watching so she could get back to studying for her PSAT test tomorrow. She really wants to see the rest with me later. Seriously?! Teenagers are so silly. Oh, and if you have some little ones, I just discovered True and the Rainbow Kingdom. The series is about a little girl, her cat friend, and wishes to help solve problems. It’s so unbelievably cute and sweet that I’m tempted to watch it myself. 😛 For more suggestions, check out the new Netflix Family page! With so many good things to watch but so little time, it looks like it will still take us a while to adjust to this new schedule. It’s tough being the adult and exercising self-control so I don’t tempt or distract my daughter from her assignments. How do you balance your kids’ school work and screen time? Do you have certain evenings during the week or do you reserve it all for the weekends? Let me know — I can use all the suggestions you have! I received a year subscription of Netflix and a device to stream the content as part of the Netflix Stream Team. All opinions are my own.